Photo: During the afternoon plenary with Naoko Ishii, GEF CEO and Chairperson; Achim Steiner, UNEP Executive Director; Tim Kasten, UNEP; INC Chair Fernando Lugris, Uruguay; Jacob Duer, INC Team Coordinator, UNEP; Masa Nagai, UNEP; and Nina Cromnier, Rapporteur, Sweden. In the early hours of Saturday morning, delegates from nearly 140 nations clinched a deal on a global Mercury Convention aiming to regulate emissions and releases of a notorious heavy metal with significant health and environmental effects. Over 900 people including government delegates, civil society groups, profit and non-profit organisations took part in extensive negotiations on complex issues such as mercury-related health impacts. Uruguayan Chair of negotiations Fernando Lugris emphasized the significance of this achievement in the post-Rio+20 world. The Minamata Convention on Mercury – named after a city in Japan where serious health damage occurred as a result of mercury pollution in the mid-20th Century – provides controls and reductions across a range of products, processes and industries where mercury is used, released or emitted. These range from batteries, lamps and cosmetics to the mining, cement and coal-fired power sectors. The new agreement also addresses the direct mining of mercury, export and import of the metal and safe storage of waste mercury. The Convention is the outcome of a lengthy process that started in 2009 and will be open for signature at a diplomatic conference in Japan in October. UNEP representatives are confident that the 50 ratifications required for the Convention to come into force will be achieved within the next three to four years. Initial funding to fast track action until the new treaty comes into force has been pledged by Japan, Norway and Switzerland. Support for developing countries is also expected from the Global Environment Facility once the convention is operational. “Everyone in the world stands to benefit from the decisions taken this week in Geneva - in particular the workers and families of small-scale gold miners, the peoples of the Arctic and this generation of mothers and babies and the generations to come. I look forward to swift ratification of the Minamata Convention so that it comes into force as soon as possible,” he said. 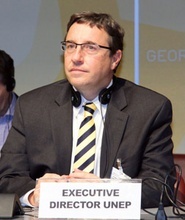 Chair of negotiations Fernando Lugris emphasized that the Minamata Convention is not a soft law instrument but a legally binding agreement that will become part of international environmental law. Compliance will however depend on guidance and monitoring from the Conference of the Parties (COP) to be established once the Convention comes into force. The scope of the new treaty which puts in controls and also reduction measures in respect to mercury is as follows. Governments have agreed on a range of mercury containing products whose production, export and import will be banned by 2020. Certain kinds of non-electronic medical devices such as thermometers and blood pressure devices are also included for phase-out by 2020. Delegates agreed to a phase-down of the use of dental fillings using mercury amalgam. The booming price of gold in recent years has triggered a significant growth in small-scale mining where mercury is used to separate gold from the ore-bearing rock. Emissions and releases from such operations and from coal-fired power stations represent the biggest source of mercury pollution world-wide. Workers and their families involved in small-scale gold mining are exposed to mercury pollution in several ways including through inhalation during the smelting. Mercury is also being released into river systems from these small-scale operations where it can contaminate fish, the food chain and people downstream. Governments agreed that the treaty will require countries to draw up strategies to reduce the amount of mercury used by small-scale miners. The new treaty will control mercury emissions and releases from various large industrial facilities ranging from coal-fired power stations and industrial boilers to certain kinds of smelters handling for example zinc and gold. Waste incineration and cement clinker facilities are also on the list. Nations agreed to install the Best Available Technologies on new power plants and facilities with plans to be drawn up to bring emissions down from existing ones. The negotiations were initially looking to set thresholds on the size of plants or level of emissions to be controlled. But it was decided this week to defer this until the first Conference of the Parties (COP) after the conventions comes into force. Final Negotiations on Mercury Convention Kick Off in Geneva.